Everyone knows that carbon fibre is not cheap, but because of the properties such as light weight and excellent strength makes it an ideal choice for body panels and the like. Carbon fibre has been used in automotive, aerospace, sports and many more industries. And you know what? Carbon fibre now available in music industry. 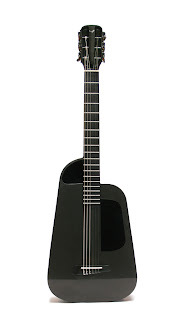 Blackbird Guitar (blackbirdguitar.com) has been produce several type of cabon fibre gutar since 2007. This carbon fibre guitar is so special because carbon fiber can be moulded to any shape. The designers weren't forced to build a traditionally flat-backed guitar just to suit the properties of the material. And the whole guitar weight just three pounds, despite being much tougher, more scratch-proof and waterproof than its wooden cousins.